ECTA Regulatory Conf '15 "We’re not going to pilot the first generation of VR games because the infrastructure isn’t good enough," according to the European Commission's head of broadband, Anna Krzyzanowska, who added: "That might be one of the greatest opportunities lost in the current time." The EC's policy wonk made the comment during a discussion at the ECTA (European Competitive Telecommunications Association) Regulatory Conference in Brussels on Monday afternoon. It did rather a good job of encapsulating some of the deep frustration felt by ISPs and comms outfits who characterise themselves as "leading challenger telecoms operators" in the European Union, with the challengers being incumbent telcos, of course. To stick with the time-worn theme of lashing out at the big boys in the telecoms market across the 28-member-state bloc, ECTA – in light of the recent net neutrality ruling by the European Parliament – has formed a lobby group within its lobby group. 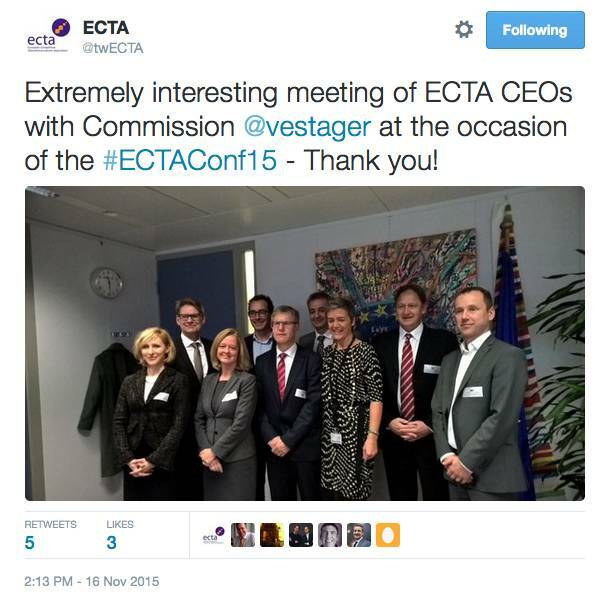 Step forward the ECTA CEO Council. Its mission? Cut through consolidation and dominance in the telco market to allow the smaller players in the EU to compete more fairly to apparently help them to bring "affordability of high quality connectivity" to 500 million netizens. Colorado, US-headquartered Level 3 Communications' EMEA regional prez, Andrew Crouch, said that his company had agreed to help form the advisory group because it backs "efforts to bring about a strong implementation of net neutrality in Europe". Other firms to have joined the council, whose members rubbed shoulders with Brussels' antitrust chief Margrethe Vestager on Monday, included telco Tele2 and web-hosting outfit 1&1. ECTA broadly pushes for regulatory rules that it says will help bring about competition for and a flood of cash to both infrastructure and services.